Bring a well loved fairy-tale to life with these beautiful hand knitted Hansel and Gretel dolls. Each doll has been hand made from the finest lambswool and dressed in hand crafted garments to resemble the real fairy-tale characters. 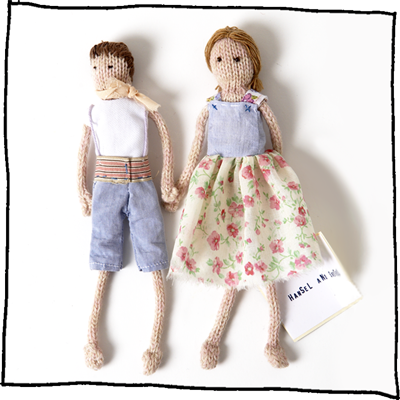 The clothes are created using found and collected vintage fabrics, so no two dolls are ever the same. The dolls can be altered to match children you know. Please see below to attach a photo or contact Laura directly with details. Both dolls are beautifully packaged together in a gift box. Extra clothes are available for both dolls – for when you’ve helped them escape from the witch’s house.